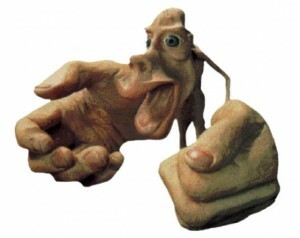 A homunculus is a scale representation of human physiology. The outsized parts have greater significance in whatever aspect is being analyzed. The example above is a motor homunculus, drawn to demonstrate the division of the brain’s motor cortex. The more bandwidth is devoted to a particular body part in the motor cortex, the more potential dexterity in that part – and the larger it appears on the model. As can be deduced from the spindly arms and legs of the homunculus, these parts take up little space in the motor cortex. In fact, just a third of it is dedicated to controlling the arms, legs and torso. Another third serves the face, tongue, and voice – hence the giant lips on our model. The remaining third of the motor cortex is devoted to the hands, particularly the thumb and index finger. Because of this division of the motor cortex, the fingers will always be our most skillful members. You might be able to train yourself to write with your foot, but you will never learn to do it as well as with your hand. It’s physically impossible. Where does the mouse come in? By now you may be wondering how this principle applies to ergonomic mice design. With the exception of a few foot-operated models, aren’t all mice controlled with the dextrous hand and fingers? Perhaps surprisingly, the answer is no. Most ergonomic mice designs are built like casts or braces. They are very large, with curves to accommodate every part of your hand. The reasoning for this is simple: part of the body – the wrist, for example – hurts when moved, so immobilize it and get rid of the pain. To see the problem in this approach, let’s go back to the homunculus. With his large, dextrous hand immobilized by the conforming curves of an ergo mouse, he must use his arm and shoulder to keep control. But as we saw, the arm and shoulder weren’t built for control; they lack the motor cortex bandwidth. Using the hand as it was designed. Ergonomic mouse design presents a conundrum. The fingers alone are not strong enough to bear the burden of day-in-day-out mouse control; the arm and shoulder offer strength, but lack dexterity. The answer is to use the entire system, shoulder to fingertips, as it was designed to be used – together, with every part sharing in the load. The role of an ergonomic mouse is not to force the hand into a “comfortable” position, but to get out of the way and let the hand find its own position naturally, in concert with the arm and shoulder. This was our goal when designing the DXT mouse. Its small, vertical, pen-like design results in a balanced distribution of work throughout the fingers, hand, wrist, forearm, and shoulder. This not only promotes long-term health and comfort, but also enhances precision by harnessing the largest section of the motor cortex – the section controlling the thumb and fingers. The shoulder is designed to position the hand ‘in space’ where the hand can then carry out precision movements. The shoulder is designed for large gross movements and is not designed to complete small precision movements like moving a cursor on screen for example. As discussed in the post above a total of about one third of the motor cortex is dedicated to the control of the fine movement of the hand and a further third is dedicated to the rest of the arm, the whole of the leg and half the body. This shows you why relying on your shoulder to move a mouse will significantly reduce the accuracy of your cursor.